I studied the video of Trump’s confrontation with CNN’s Jim Acosta and came to a definite conclusion based on what actually happened. 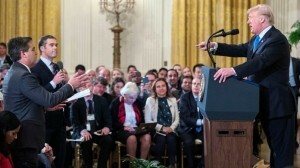 The next reporter put in a good word for Acosta to which Trump replied, “Well, I’m not a big fan of yours either.” And when Trump wouldn’t answer the report’s question again, the reporter asked, “Why are you pitting Americans against each other?” Trump replied, “What are you, trying to be him?” pointing to Acosta then ordered the reporter to sit down. He then refused to answer any other questions posed by other reporters, cut them off, bullied them, rambled on about himself, and then stated the media was hostile: “It’s so sad…you asked me… No… you rudely interrupted him,” and pointed to someone else. Trump’s refusal to answer questions he didn’t like spurred the reporters to repeat the questions, and he couldn’t hold back his temper. The bully in Trump came out full blast, and as bullies always do, he blamed everyone in the room. Now he’s going to write rules and regulations about decorum so he can have an excuse to revoke the press passes of reporters he doesn’t like or stop the news conference and walk out, which he always had the right to do. The fact is: Trump is the person who destroyed decorum by pointing his finger and throwing out the first insult, and then the verbal attacks on Acosta and the other reporters escalated from there. The lack of decorum was clearly Trump’s doing, but we know he’ll never admit it. He’ll double down on ‘fake news’ and continue his assault against the free press and the constitution of the United States. If you think it stinks in this pig pen, you’re right. Oink-Oink! There’s nothing mundane in the writing world of Terry Wright. Tension, conflict and suspense propel his readers through the pages as if they were on fire. Published in Science Fiction and Supernatural, his mastery of the action thriller has won him International acclaim as an accomplished screenplay writer. A longtime member of the Rocky Mountain Fiction Writers, he runs their annual Colorado Gold Writing Contest. Terry lives near Denver with his wife, Bobette, and their Yorkie named Taz. He invites you to visit his Web site at www.terrywrightbooks.com. This entry was posted in National Commentary. Bookmark the permalink.